The Office of the Vice President for Research and Innovation has announced a new seed funding program aimed at growing new collaborations between researchers at Oregon Health & Science University and the University of Oregon. The two research institutions jointly issued a request for applications for the program Feb. 16. The program is one of the results of a daylong summit that took place in April 2017 and included about 90 UO and OHSU researchers and institutional leaders from a variety of disciplines. The group identified research topics where each institution has complementary strengths, discussed existing barriers to collaboration and brainstormed solutions. UO and OHSU are both developing major new research facilities thanks to unprecedented gifts from the same benefactor. The official groundbreaking for the UO’s Phil and Penny Knight Campus for Accelerating Scientific Impact is March 2; OHSU broke ground last June in Portland on a new research building for the Knight Cancer Institute. Both are $1 billion projects initiated by separate $500 million gifts from Nike founder Phil Knight and his wife, Penny. 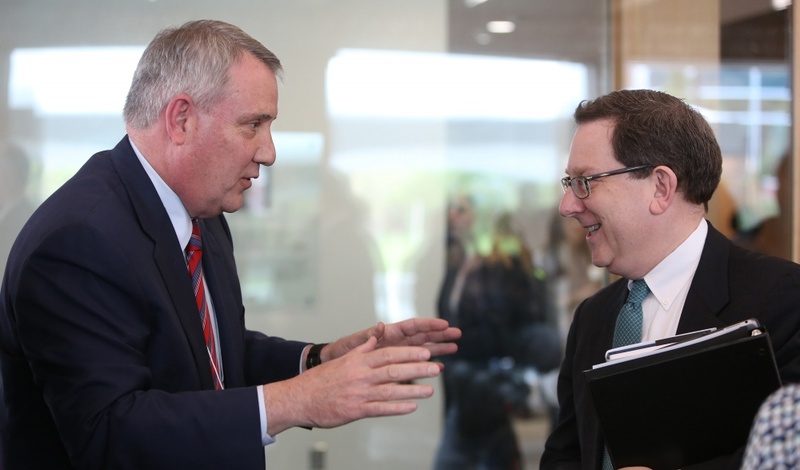 UO President Michael Schill and OHSU President Joe Robertson both voiced strong enthusiasm for the new seed funding program, which aims to increase the number of externally funded OHSU-UO collaborative projects. OHSU President Joe Robertson expressed similar support for the collaborative initiative. The Office of the Vice President for Research and Innovation will host an information session Thursday, March 1 from 1:30 to 2:30 p.m. in Room 119, the Diamond Lake Room, in the Erb Memorial Union. Researchers interested in learning more about the opportunity are encouraged to attend. Visit the OHSU-UO Partnership website for more information.